Of course, nothing could be further from the truth. 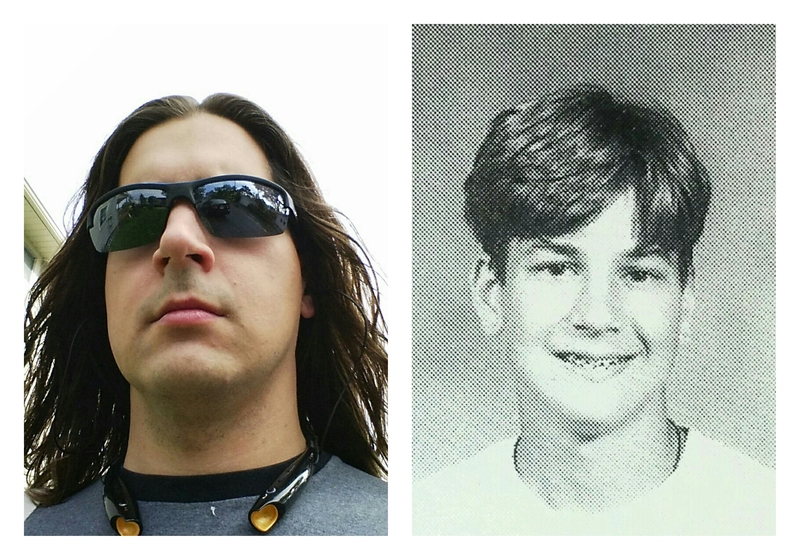 In 1997, I was a high school sophomore, but that’s the end of the resemblance. I had no cool. I looked young for my age, I had braces, I had short hair and didn’t really care about it, I was a band and choir and theatre nerd, and I thought the Beatles were the pinnacle of musical evolution — I’m pretty sure I remember telling a cousin that his Smashing Pumpkins CD sounded like a bunch of noise. I’m still not cool. But in many ways, I’m conscious of feeling ever more comfortable in myself (which I’ve realized decades later is really the essence of cool), and in ways that, oddly, harken back to those high school years. I’ve been feeling lately like the flourishing of a seed planted half a lifetime ago, now finally bearing fruit. Many of my formative experiences happened in the Boy Scouts. Not so much within the formal program itself, though I did learn about self-reliance and perseverance from my many activities. But the experiences that I now look back on as both formative and indicative all hover at the fringes of the BSA. I first realized my queer identity thanks to a late-night viewing of Chasing Amy during downtime as a staffer at a boy scout camp: when Alyssa (Joey Lauren Adams) explains her bisexuality to Holden (Ben Affleck), saying that it just made no sense to her to close off the possiblity of love with half of humanity, simply because of their gender, it was like a bolt of lightning: my life suddenly snapped sharply into focus. I was so thunderstruck that I had to have a panickedly frank coming out conversation with my tentmate (who was as kind and calm a first person to come out to as I could have asked for). And yet I didn’t tell another soul for years, didn’t date until grad school; I kept it hidden deep in my chest. It was also while working at the Boy Scout camp that I encountered paganism. My area director Seth and his girlfriend Kayci (also on staff) were Wiccan, and they were happy to talk openly and evenly about the experiences that had led them to their religious practice. I had intense, meandering discussions with both of them about religion and about life in general, especially during long campfire nights supervising campers with Seth (who I looked up to as a sort of big brother). I even bought a book or two to learn about their religion, to the confusion of my Catholic parents. Even as I continued to practice my Catholicism, I gained a greater perspective on faith and religion; I started calling the moon Diana and seeing her as a part of God. I remember sitting at the edge of a field watching a storm roll in, reveling in the power of the lightning and thunder, their bright silver forks set in the endless deep purple of the East Texas sky at dusk. And yet, even after I fell away from the Church, despite these experiences and a large of number of pagan friends, I never thought to turn to the Old Gods; they waited patiently. For me, the most telling fruition, which at the time never seemed incredibly insignificant, was a necklace I bought during a trip to the National Order of the Arrow Conference in Ames, Iowa, in 1998. (The OA is often described as the BSA’s honor society, and NOAC is its quadrennial gathering.) While we were there, my best friend and I checked out the main drag near Iowa State’s campus, where I bought a necklace at some shop we wandered into. I’ve never worn much jewelry — at the moment, the only adornment on my body is my wedding band — and yet when I saw the triangular pewter pendant, engraved with Celtic knotwork, I immediately brought it to the counter. I wore that pendant daily for years, tracing its lines with my fingers until I knew them like my own thoughts, until the loop became dangerously thin from my constant fidgeting, at which point I kept the knot carefully in a box on my desk. And yet, if anyone asked me its significance, I’d shrug and answer (truthfully, as far as I knew), that I just liked it. I was telling the truth inasmuch as I knew it, but I don’t think I actually knew the truth. Just as much as my sexuality was an innate truth, simply waiting for me to finally understand all the longing looks I gave to my classmates’ biceps, chests, and changing faces, so too was my druidry resting inside me, waiting for me to give it the space to flower. I’m not one for signs and portents, and yet when I look at that pendant, darkened from years of lying against my skin, I can’t help but feel the Shining Ones knew me before I knew them. It’s taken me years, but I’m glad of their patience as they waited for an awkward teen to become a man he didn’t yet know he could be. Posted on July 26, 2015 by Mike BierschenkPosted in UncategorizedTagged adulthood, beginnings, Boy Scouts of America, growth, manhood, sexuality.